They can both illustrate and support text, but also help make things real. This certainly goes for libraries. They can show activity, a pleasant space, great resources, and help people you’re talking with imagine themselves there. They are an important tool for advocacy, even more so with the rise of social networks and other online means of communication. 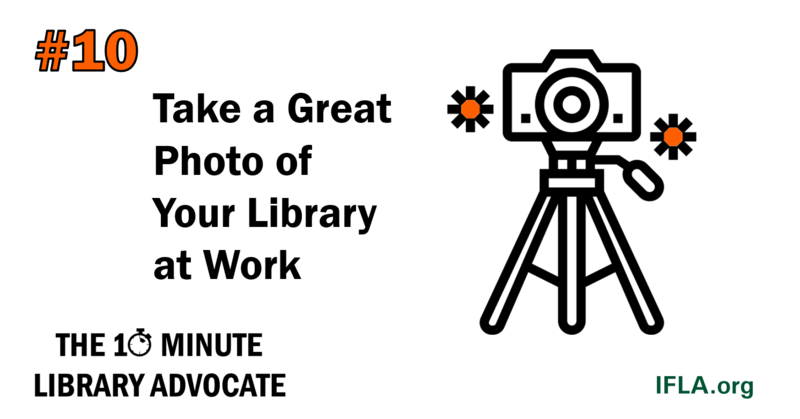 So for our tenth 10-Minute Library Advocate exercise, take a great photo of your library at work. Make sure it shows something positive and attractive that will support your advocacy. Ideally, and if they (or their parents, if they are children) are happy to be photographed, include users! If you’re not a great photographer, try and find a colleague or user who is. There may be a local photography club – you could start a competition. Make sure you get permission to use the photo of course. You can find some great hints about photos in the Library Map of the World Storytelling Manual. Once you’ve got your photo (or photos! ), you can start to make your website, social media presence and other advocacy tools more lively. See the introduction and previous posts in our 10-Minute Library Advocate series and join the discussion in social media using the #EveryLibrarianAnAdvocate hashtag!